Related keywords are keywords which are automatically selected by Yandex.Direct. Ads for these keywords are served on Yandex search results pages and search sites that are part of the Yandex Advertising Network. No matter how carefully you study the set of keywords, it is impossible to take into account all the variations on search terms. According to our research, about 40% of search terms have only been used once throughout the entire history of searches. But if you skip low-frequency queries, you lose clients who might have found you. Additional relevant phrases will help fill this gap. Keeping a large set of keywords up to date is a time-consuming task. Additional relevant phrases will help you save time on keyword selection. Yandex.Direct selects keywords from the same or similar categories to add to the keywords you already set. During the keyword selection process, your source keywords, negative keywords, ad texts, and landing pages are taken into account. If the site has a Yandex.Metrica counter installed and goals configured, Yandex.Direct selects keywords so that impressions convert at a higher rate. As statistics are accumulated, the system learns and optimizes future keyword selection. Related keywords that do not perform effectively will be automatically disabled. The degree of proximity of the selected keywords to the original keywords is controlled by the maximum expenditure value for related keywords. A default phrase will be inserted in ads that use templates when they are triggered by a related keyword. Related keywords are enabled by default for new campaigns. You can change the settings on the campaign settings page in the Special settings section. The maximum expenditure on impressions for related keywords is given as a percentage of the total campaign expenditure. This restriction will apply for a week. The restriction may not hold if the rate for the keyword exceeds the maximum expenditure that was set. For example, let's say that your daily campaign budget is 1,000 rubles, your maximum expenditure is 5% (50 rubles), and the bid is more than 50 rubles. Your maximum expenditure affects how closely related keywords match your original keywords in the campaign. If the value is small, only the keywords that are closest in meaning get added. As your expenditure increases, the keyword selection area expands and keywords that are less close in meaning also get added. Select a Yandex.Metrica goal and Yandex.Direct will select related keywords so that your impressions convert at higher rates. You can select a goal if at least one converted session took place after you launched your ad campaign. If you already use theAverage cost per action, Average return on investment or Weekly budget: maximum conversion rate conversion strategy, you do not need to enter a goal. 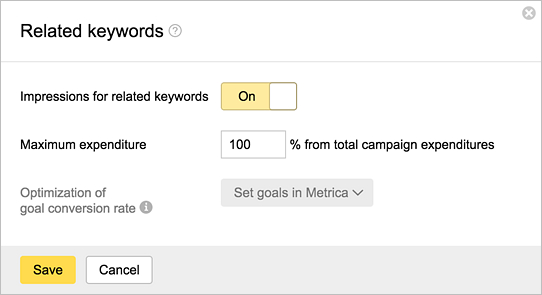 Related keywords will “work” towards achieving the goal entered in your strategy settings. Yandex.Direct automatically sets bids for each related keyword, guided by the bids for your original keywords. The maximum bid for a related keyword cannot exceed the bid for the original keyword. The original keyword takes priority over a related keyword when keywords are being selected for impressions. CTR that accumulated from related keywords does not affect the CTR of the original keywords or ads. The end goal of advertising is not impressions and clicks, but orders and requests. You need to evaluate how effective related keywords are in your campaign based on their conversion rate. If you have not yet done so, set up Yandex.Metrica and set goals, which are the key actions that site users should perform. If the main goal of your ads is to get users to make purchases on your site, set up ecommerce data collection. You can compare indicators for related keywords and original keywords in the Report wizard. Filters: specify the goal you want to measure conversions for. You will see how many additional conversions and how much revenue you get from related keywords, as well as the cost of these conversions. Tip. If you are satisfied with the goal cost for related keywords, we recommend increasing your budget expenditure to attract more relevant traffic to your site. If the goal cost is higher than you'd like it to be, you should take a more detailed look at your data. Add an Impression criteria column to the report described in the previous step; the original keyword will display there. Sort the report rows by the Clicks column value. For rows with a significant number of clicks, review the data in the Goal cost and Revenue columns. That way you can identify the keywords that have related keywords with underperforming indicators. You can check each of these keywords in the Search queries report. In the Search query column, you will see the real query entered by the user, and in the Matched keyword column — a related keyword. You will see how many additional conversions and how much revenue were generated by each query, as well as the cost of these conversions. If a query did not lead to conversions or the conversions turned out to be too expensive, you can go to the report page and add that query to the negative keywords for the campaign or ad group. On the other hand, you can add effective queries to your keywords (in order to, for example, manage bids for them). Read the Search queries report for more information on how to do this. Additionally, you can prevent impressions from being served based on undesirable queries by adding negative keywords to the original keywords. Why are ads triggered by strange queries? Some of the selected keywords and search queries may not seem suitable to you, yet still lead to conversions. It is important that you not focus on the semantic content of the chosen keyword, but rather the conversion cost and revenue. Ineffective queries can be filtered out by adding negative keywords. How can I find out which related keywords were selected? It is impossible to find out in advance what related keywords Yandex.Direct chose. You can see keywords that have already had impressions in the Search queries report in the Matched keyword column. Why is there a dash in the “Search queries” report under the“Matched keyword” column if the match type is “related keyword”? This means that the related keyword was not selected beforehand. Yandex.Direct determined that the ad and related keyword were relevant to the user query at the time the request was sent. Analyze key indicators for related keywords regularly: conversions, goal price, revenue. Determine what price you are willing to pay for the goal. Try increasing your maximum expenditure to get more additional conversions. Find the least effective queries and add them to your negative keywords. Find the most effective search queries and consider adding them to your keywords or even creating separate ads for them. Try reducing your maximum expenditure. Analyze the keywords in your campaign. The system selects related keywords based on the keywords you set. If related keywords are not effective even at your minimum expenditure level, the cause is most likely underperforming original keywords.